The hyper-local East Van Panto is back for its fifth year entertaining young and old alike, and it’s as irreverent and hilarious as ever. This year, a goth Snow White (Ming Hudson) escapes from the evil queen’s house in West Vancouver to cross the Ironworkers Memorial Bridge to East Van, a magical land she has always dreamed of visiting. On her travels, she ends up at the PNE and meets a washed up ’80s rock group called the Seven Dwarves who live in a Playland haunted house. Ben Elliott and Todd Biffard, the panto orchestra, began the show in musical style with a housekeeping song and kept the lively songs coming all evening. The panto takes pop songs and writes new lyrics to fit the show, such as Snow White singing to the tune of Lorde’s “Royals” with the lyrics, “I’ll never be joyful.” Amy Rutherford, taking a census of the audience, warmed us up with the panto conventions of cheering, booing, and warning characters about bad guys behind them. The show is so local that an East Van crow was written into the script. Canuck rose to fame after stealing a knife from a crime scene and has been a neighbourhood celebrity ever since. He’s a friend of Snow White’s, but, with his kleptomaniac tendencies, he steals her “phob to the city.” It all works out though, because we come across an internet troll who lives under the Ironworkers Memorial bridge who offers to 3D print a replica. In order to cross the bridge, Snow White must make it past the troll’s offensive comments and get through to him emotionally. Heimlich (Chirag Naik), the Queen’s servant, is an unpaid intern who is tasked with killing Snow White — the only problem is he’s in love with her. His signature manoeuver does end up coming in handy when Snow White takes a bite of the poisonous apple. Once again, the East Van Panto is packed full of puns, political jokes, hilariously rewritten pop songs, and local references. 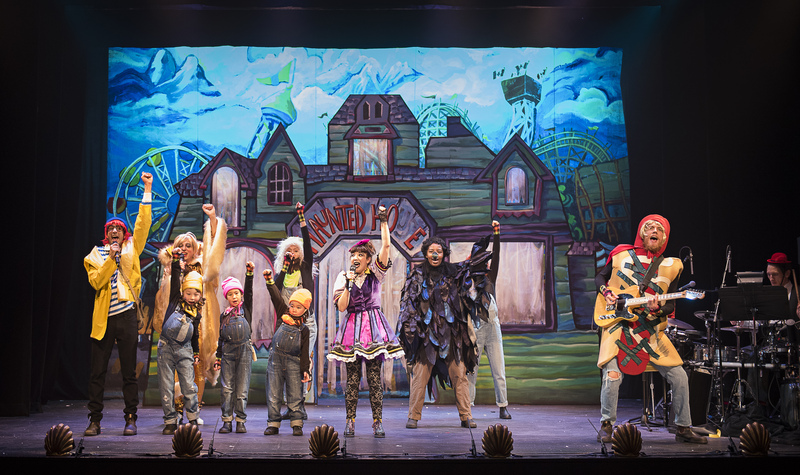 The fusion of intelligent and lowbrow humour is what makes pantomime so effective. The adults can laugh at references to the Sears pension plan, Kinder Morgan, Trumps’ children, and the long form census, and everyone can revel in the endless shenanigans of these wacky characters. If you’re lucky, Canuck might even throw you some candy.